South Gujarat. They bring their own style to Gujarati food. Gujarati dishes are distinctively sweet, salty, and spicy at the same time. The typical Gujarati meal consists of Roti, daal or kadhi, rice, and a curry. 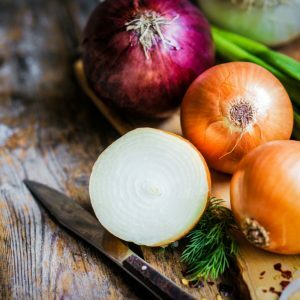 The cuisine, spices and vegetables changes with season. For example in summer season, very less spice is used in cooking and lots of Mangoes and mango pulp are used in many dishes. Let us see what is predominantly prepared in the four regions mentioned above. 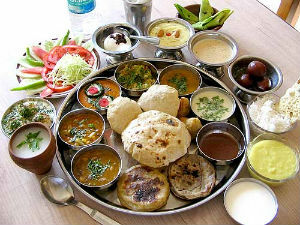 North Gujarat is the home of traditional Gujarati cuisine with the Gujarati Thali being very popular. A special appetizer called Farsan, Dhokla and Khandvi(chickpea flour), daal and khadi (or both) puri or roti (they call it rotli), vegetable sabzi (curry), salad consisting of sprouted beans and cucumber, tomato/onion raita, a milk sweet most often Dhoodpak which is an exotic combination of sweetened condensed milk with saffron and sprinkled with nuts. Papads, chutneys and pickles accompany every meal and are preferred a lot. This region is perhaps the healthiest and conventional in it’s cooking with oil and spices used in minimum. 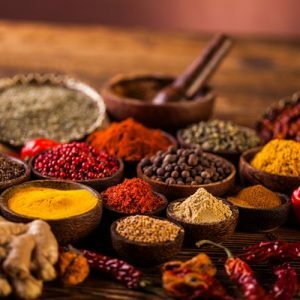 North Gujarat with just a lot of spices. These people also have a sweet tooth and one can see a lot of sweeteries and bakeries locally. Sweets like Nankhatias andGharis are very popular in this region. South Gujaratis eat simple food with a lot of life in it in the form of green chillies. Kathiawari’s (Saurashtra)popularity is Debra. It is made with wheat flour, spinach, green chillies, a pint of yoghurt, salt and sugar to taste. It is eaten with a specially prepared hot and sweet mango pickle. The Kathiawari speciality with respect to spices is called Methi masala. Fenugreek is dried and ground with red chillies and salt. This is used to flavor curries and other dishes. In Saurashtra during the harsh cold winter bhakris, a type of thick rotis, made from wheat flour, garlic, onion, buttermilk and a lot of spices is made. It keeps the body warm. Phafda, an omum flavoured assorted flour puri is another Kathiawari favourite. Pulses dominate Kathiawari food and sweetmeats made of jaggery. They also eat a lot of peanut and til cookies. This region has a delicious variety of pickles. Kathiawar use a lot of red chilies in their dishes. The main dish of this region is Khichdi. Our site has numerous variations and multiple recipes to satiate every tongue which is fond of Khichdi. It is eaten with Kadhi – a spicy gravy made of yoghurt. Khaman Dhokla, Doodhpak and Shrikhand (eaten with hot fluffy puris) are part of the everyday meal. Gujaratis in general from all the above four regions eat a simple everyday meal which is daal, rice, rotli,shaak.During festive days, additional and more varieties of shaak, sweet dishes and Farsan is prepared. There is a specific dietary rule followed in just this foursome combination. Here is what it is. For example, if kadhi is served, then a daal or vaal will also be included. The sweet dish accompanying kadhi will likely be milk or yogurt-based, like doodhpak or shrikhand. In such a meal raita would not be served. Festive meals which serve daal will typically have a wheat-based sweet dish like lapsi or ladu as the sweet accompaniment. 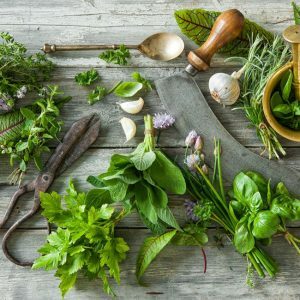 In a similar way, certain combination of spices is used with different foods which aids in digestion. Gujarat has specific non-vegetarian dishes in contrast to the majority who are pure vegetarians. They are famous for their great variety of soups – hot and cold, clear and liberally mixed with cashew nuts and diced vegetables. Their major non-vegetarian dish is their beef preparations called malai tikka and malai wa khalija. An exclusive beef dish is the sagle bagla. Some common sweets prevalent in all these regions and communities are Basundi, Ghevar, Puran Poli, Malpua, Halvasan, Keri no ras, Shrikhand, Sutarfeni, Son papdi, Barfi, Halwa, Ladu, Shiro, Jalebi, Laapsi, Dhoodpak, Shakkarpara, Coconut barfi, coconut halwa, Carrot halwa, Bottle Gourd Halwa… Oh well, I will stop here. They have a very sweet tooth indeed. A vegetarian wonder is what one would call a complete wholesome Gujarati cuisine. An assorted combination of green leafy vegetables, seasonal healthy vegetables, with a delectable collection of spices makes it very palatable and tasty. Goodness of milk, yoghurt, buttermilk, coconuts, groundnuts and various other nuts make this meal rich in proteins even with the absence of meat and eggs. The land which gave the Mahatma to the nation follows this basic principle – Simple living and high thinking. Feel free to comment or share your thoughts on this "Gujarati Cuisine" article from Awesome Cuisine.